Recent studies have revealed that the translation English to Spanish is the most commonly requested source and target language pairing. This may be due to the close proximity of many Spanish speaking populations as well the fact that Spanish is the second most popular spoken language in the world, right behind English, with over 332 million native speakers worldwide. Since both the English language and the Spanish language have their own native idioms and phrases it is important to use a highly skilled translator who can fully understand and convey the true meaning of all spoken nuances for translation English to Spanish. Many times when a conference, guided-tour or other speaking event requires the translation English to Spanish, two-way communication is also a concern. If there is more than one presenter who will be speaking in a different language it is important to provide listeners with the opportunity to understand both languages. Additionally, if the main presenter will be required to understand and responded to comments and questions from listeners two-way communication systems will also be necessary. For example, a presenter may be giving a guided tour in Spanish English (the source language) while listeners will hear the translated audio in English Spanish (the target language). However, if one of the listeners has a question for the presenter, they will have to be able to hear the question asked in English Spanish (the target language) translated to Spanish English (the source language). This translation English to Spanish will require a multi-channel receiver so each listener can hear the audio in their appropriate language. 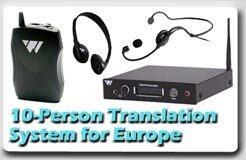 For the best audio quality and instant translation it is also advised to use a separate transmitter for each language. 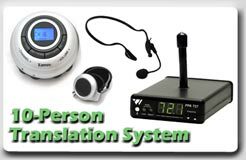 Having a separate transmitter will avoid a lapse in translation that would occur as a single transmitter is adjusted to switch back and forth between languages. 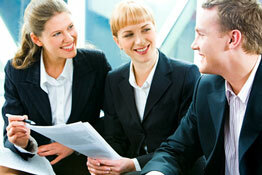 In most cases, when translating back and forth between two languages only one interpreter is needed. Many times when a conference, guided-tour or other speaking event requires the translation English to Spanish, two-way communication is also a concern. If there is more than one presenter who will be speaking in a different language it is important to provide listeners with the opportunity to understand both languages. Additionally, if the main presenter will be required to understand and responded to comments and questions from listeners two-way communication systems will also be necessary. For example, a presenter may be giving a guided tour in Spanish English (the source language) while listeners will hear the translated audio in English Spanish (the target language). However, if one of the listeners has a question for the presenter, they will have to be able to hear the question asked in English Spanish (the target language) translated to Spanish English (the source language). This translation English to Spanish will require a multi-channel receiver so each listener can hear the audio in their appropriate language. For the best audio quality and instant translation it is also advised to use a separate When utilizing two-way communication, whether it is translation English to Spanish or the back and forth translation of two other languages, it is also recommended to use an interpreter console. An interpreter console also allows the interpreter to control what audio output is sent to which devices and on which channels, this allows the translator to switch back and forth between channels, so their translation can be relayed to either the audience or the presenter based upon who is talking. An interpreter console also allows the interpreter to adjust the tone and volume of the audio coming into and out of their transmitter. This is useful with translation English to Spanish, as each language has its own tones and sound frequencies. Being able to adjust these levels makes the listening experience pleasant for both the interpreter and their audience.